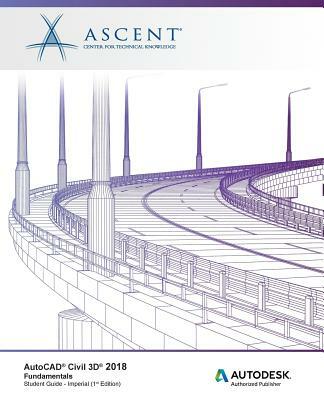 The AutoCAD(R) Civil 3D(R) 2018: Fundamentals student guide is designed for Civil Engineers and Surveyors who want to take advantage of the AutoCAD(R) Civil 3D(R) software's interactive, dynamic design functionality. The AutoCAD Civil 3D software permits the rapid development of alternatives through its model-based design tools. You will learn techniques enabling you to organize project data, work with points, create and analyze surfaces, model road corridors, create parcel layouts, perform grading and volume calculation tasks, and layout pipe networks. Learn the AutoCAD Civil 3D user interface. Create and edit parcels and print parcel reports. Create points and point groups and work with survey figures. Create, edit, view, and analyze surfaces. Create sites, profiles, and cross-sections. Create assemblies, corridors, and intersections. Create gravity fed and pressure pipe networks. Perform quantity takeoff and volume calculations. Use plan production tools to create plan and profile sheets. Experience with AutoCAD(R) or AutoCAD-based products (such as Autodesk(R) Land Desktop) and a sound understanding and knowledge of civil engineering terminology.